The REHAP project is transforming agricultural and forestry waste into high added value products for the construction sector, reducing energy-use and CO2 emissions. Agricultural and forestry residues are being used in many new innovative ways, with the bio-based chemical industry now showing greater growth than the petrochemical industry. The development of chemicals and materials from lignocellulosic biomass (dry plant matter) is a particularly important area in terms of research, thanks to the abundance of these resources and because they do not compete with the food chain. However, the conversion of lignocellulosic biomass is not easy and still has little commercial viability. 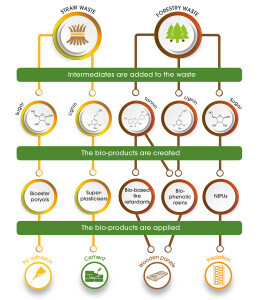 REHAP Project aims to strengthen the European bio-economy industry by creating novel materials from agricultural and forestry waste. It will also consider how they can be used commercially in the green building sector. In the EC’s Bioeconomy Strategy, forestry and agricultural wastes are crucial. REHAP Project will use bark and straw to develop its products. Bark is well suited for developing eco-friendly, high-value industrial products. As it contains bioactive molecules, there is a huge potential for applications in medicines, cosmetics, industrial chemicals and plant protection products. There is an estimated 50 to 110 million tonnes of straw dry matter available in the EU every year. In the right hands this is an incredible resource: wheat straw for instance contains roughly 10% silica, in addition to 40% cellulose and 20% lignin, all useful in a variety of applications. Develop methods to convert natural wastes into sustainable polyurethanes. These can be used to develop insulation foams and adhesives, as well as fire-retardant products. Develop new high-performance bio-resins to produce eco-friendly wooden panels. Produce eco-friendly sustainable cement with improved properties. Design and assemble an environmentally sustainable and fire-resistant construction solution. Demonstrate the development of eco-friendly products and their sustainability and business potential compared to existing solutions. Purification of lignin, tannin, and sugar from agroforestry residues. REHAP has been developing optimised protocols for extracting lignin, tannins and sugars from agroforestry residues. A method for extracting tannins from bark was developed by partners VTT, the Technical Research Centre of Finland, and was successfully transferred to the lab at the Bio Base Europe Pilot Plant (BBEPP) in Ghent, Belgium, where it has been scaled-up to pilot scale. Traditionally, tannins are extracted from the bark by hot water extraction. The new process closely resembles the kraft process used to convert wood into wood pulp, using higher alkaline conditions and higher temperatures than hot water extraction. Another partner TECNALIA has been working on the saccharification of the cellulosic residue generated by the purification of lignin from the woody material, poplar. Tests have selected the best enzymes and hydrolysis conditions that can increase the glucose yield and minimise the production of inhibitors that could affect the course of fermentation at the next step. Production of high-added value chemical products. BIOSYNCAUCHO, a company that aims to develop high-added value chemical products from renewable raw materials, tested and determined the best conditions for the fermentation of sugars to 2,3-butanediol (BDO), a renewable chemical building block. The fermentability of the sugars obtained from bark in BBEPP at pilot scale, have also been optimised by BIOSYNCAUCHO with excellent results in terms of 2,3-BDO production, yield and productivity. NOVAMONT, another company involved in the project, is creating active biorefineries for the fermentative production of 1,4-butanediol. Both 1,4-butanediol and 2,3-butanediol are chemicals made from renewable biomass and can replace non-renewable chemicals. Inclusive growth fostering a high-employment economy.